Brooklyn Heights, N.Y — St. Francis College Terriers (13-10 overall; 10-2 NEC) defeated the Bryant University Bulldogs (2-21 overall; 1-11 NEC) by a score of 80-67 on Saturday. St. Francis pulled out the victory Saturday as five players scored in double digits, led by Ben Mockford with 21 points. He shot 5-11 from 3-point range and 8-17 overall in 28 minutes of play. The story of the game was the long range shooting by the Terriers. They shot 44.8% (13-29). As mentioned before, Mockford led them with five 3-pointers, Perunicic made four, and Nichols made three. On this day, SFC put together a balanced offensive attack with five players in double figures. Freshmen forward Jalen Cannon recorded his sixth double-double of the season. He scored 11 points, grabbed 10 rebounds, and 3 assists in 30 minutes of work. Akeem Johnson scored 11 points as well, making all four of his field goal attempts and 3 of 5 free throws. Travis Nichols continues to be the offensive spark off the bench as the junior forward scored 13 points and grabbed 2 boards in a limited 12 minutes. Senior forward Stefan Perunicic was also in double figures, scoring 14 points on 4-6 3-pointers and 5-9 shooting overall in 29 minutes of play. He also had 6 turnovers which gave the Bulldogs a chance to get back in the game. With 7:20 left to play in the second half of the game, SFC had their largest lead (23 points) following a layup by Travis Nichols. Bryant would then storm back with a 20-6 run over the next four and a half minutes. With just 2:52 left, Bryant was only down by 9 points as they took advantage of some sloppy play by the terriers. Perunicic had four turnovers during that run. All of the turnovers led to points on the other end. SFC coach Glenn Braica would then bench the senior for the rest of the game. A lot of the work during the comeback was done by Bryant’s guard Frankie Dobbs. He scored 26 points during the game, shooting just 36% from the floor (5-14) but hit 93% of his free throws (14-15). He scored 16 of his 26 points during that 20-6 run in the final minutes. Dobbs would also grab 5 rebounds as he played every minute of the game. The SFC Terriers out-rebounded the Bryant Bulldogs by a margin of 35-26. A large majority of that indifference came on the offensive boards where SFC grabbed 14 and Bryant only had 6. Those 14 offensive rebounds turned into 18 second chance points. St. Francis has now won 9 of their last 10 games and finds themselves on a five game winning streak. After today’s game, they took sole possession of second place and are just one game behind LIU Brooklyn blackbirds for first place in the NEC. This upcoming week will be their chance to take the throne as they battle the blackbirds twice. St. Francis’ next game is the coveted battle for Brooklyn against the cross-town NEC rivals LIU on Wednesday at 9:00 p.m. in the “most famous arena in the world” Madison Square Garden. 1:00- Ben Mockford gets an easy layup as Terriers lead 74-61. 2:52- Bryant continues to fight back, going on an 11-0 run. SFC leads 69-60. 4:47- The Bulldogs go on a 9-3 run to cut the lead to 66-49. 6:55- After the media TO, St. Francis up big 63-40. 10-00- Nichols knocks down a 3 for the terriers as they lead 58-38. 13:00- Jalen Cannon throws down a crowd roaring dunk. SFC leads 52-34. 15:44- Bryant goes on a 5-0 run to cut the lead to 47-32. 18:00- Terriers lead 47-27 following Akeem Johnson’s slam. St. Francis leads by 15 points at the half thanks to their efficient 3-point shooting (7-12). Stefan Perunicic is 3-4 from long range with 11 points while Ben Mockford is 3-5 from downtown with 13 points. The terriers perimeter defense held Bryant scoreless from 3-point range (0-6). Bryant is shooting just 42.1% overall. SFC scored 17 points off of turnovers. Raphael Jordan leads the way for the Bulldogs with 9 points on 4-5 shooting in 19 minutes of play. 4:23 Perunicic drains another 3 and gives SFC a 35-20 lead. 7:00- Terriers lead 32-16 following the steal and breakaway layup by Perunicic. 9:15- St. Francis leads 27-14 on a 10-3 run following a monster slam by Cannon. 11:35- Terriers lead 17-11 after a media TO. 13:00- Bryant responds with a 5-0 run but still trail 12-9. 14:59- Terriers lead 12-4 after 8-0 run capped off by Mockford’s shot. 17:30- St. Francis and Bryant are tied 4-4 following Cannon’s layup. Game Preview: St. Francis (12-10, 6-3 at home) leads the all-time series against Bryant (2-21, 0-13 on the road) by a 4-1 margin. Last year, the NEC foes split the season series 1-1 with both teams winning their home games. 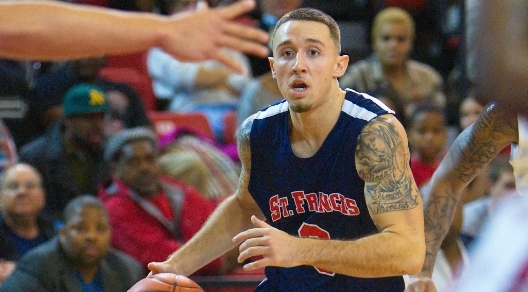 St. Francis won their last game against Central Connecticut State by a score of 73-67 and is now 9-2 in the conference. Heading into this game with Bryant University, St. Francis has won eight of their last nine games, all of which were conference matchups. Bryant has lost eight straight. St. Francis is tied with Wagner for second place in the NEC while Bryant is just 1-10 in the conference and ranked last. Sophomore point guard Brent Jones has started the last five games for the Terriers, scoring a career-high 19 points at Robert Morris last week. Jones has averaged 10.4 points, 4.8 assists, and 3.2 rebounds in those starts. Both juniors Akeem Johnson and Travis Nichols led St. Francis in scoring last Thursday against Central Connecticut State last game with 16 points each. Nichols, who came off the bench in the game, outscored the Blue Devils bench single-handedly as Central Connecticut State was only able to muster six points from their reserves in a 73-67 Terrier win. Sophomore guard Ben Mockford also chipped in with 14 points, hitting 4-10 from 3-point range. Freshmen forward Jalen Cannon ranks fourth in the NEC in defensive rebounds per game with 7.8. He also ranks number 3 in field goal percentage in the conference and teammate Akeem Johnson ranks second shooting .586 from the field per game. The Terriers have made 47-percent of their field goals, the best in the conference. In four game this season, St. Francis has made more than half of their shots.